It was an interesting start to the day. The GPS coordinates I had received from a fellow angler were supposedly going to direct me to a super panfish hotspot on a fairly large lake. Now that I was at the lake, I began to have my doubts. The super hotspot was in the middle of a sea of ice houses. Although I had expected some competition on this popular body of water, I did not expect to be surrounded by anglers. 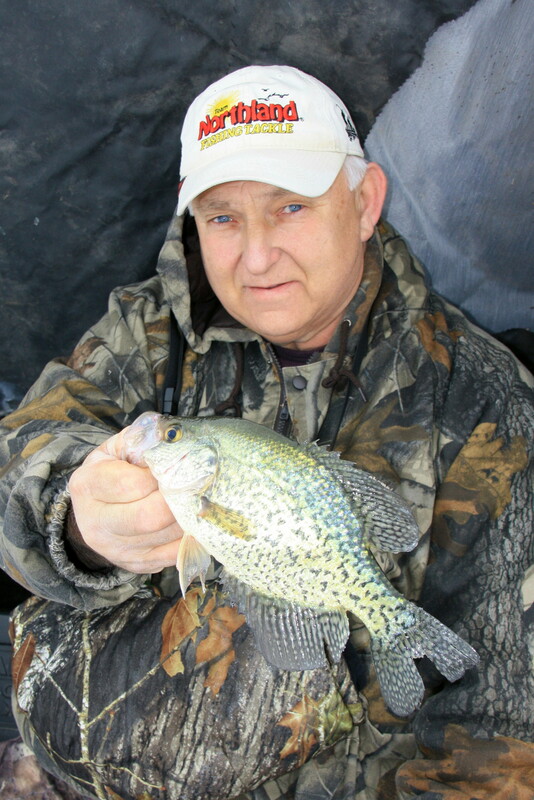 Lamont Jeitz, from Starbuck, holds a hefty crappie taken on light tackle. I could tell from the looks of my two companions that they had their doubts, as well. When they wondered what kind of mess I had gotten them into this time, I explained that my source for the GPS coordinates was very reliable. In an effort to calm their fears and to reassure my own doubts, I referenced my GPS and LakeMaster chip (www.lakemap.com) to show them how we were perfectly positioned on a two foot break on an otherwise flat piece of structure. With all of the enthusiasm I could muster, I suggested we start drilling holes. After scattering a dozen and half holes amongst the houses, we started the search process. Although our Vexilars did not show suspended fish in every hole, there appeared to be plenty of activity. The next step was to see if anything would bite. We weren’t too far into the adventure when I decided it was time to mix things up. I knew what was not working and felt I had nothing to lose by doing a little experimentation. For me, experimentation starts with downsizing both my line weight and jig size. It also means switching to a very light spring bobber rod that will detect the faintest of bites. From my arsenal, I pulled out a rod rigged with one-pound-test Berkley Micro Ice and a Northland 1/28 ounce tungsten Mooska jig. This combination of super light line and small but heavy tungsten jig had worked for me before. In a hole that had not yielded a fish, I instantly pulled two 12 inch crappie. They were followed by a couple of very respectable bluegills. 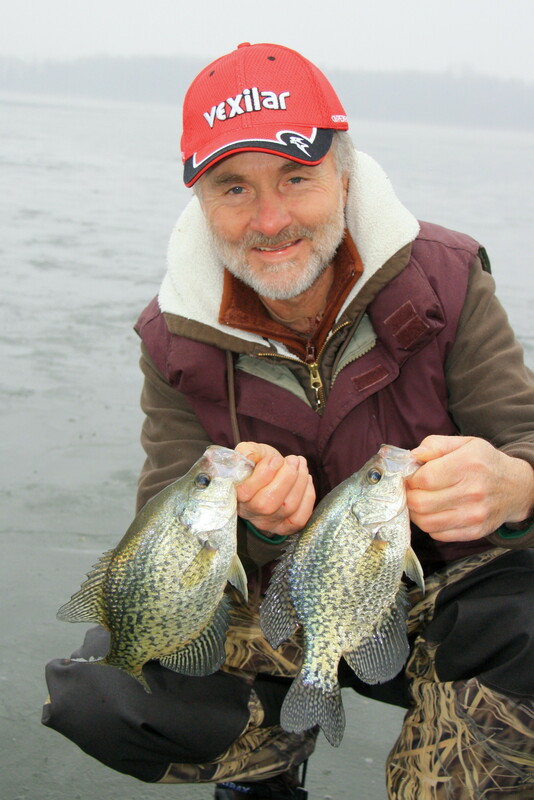 Cjarlie Simkins holds a couple of nice crappies taken after switching to super light equipment. Naturally, my sudden success not only caught the attention of my angling buddies, but also brought a couple of people out of their fish houses to see what I was doing. What I was doing was pretty much what I had done for the first hour. What was different was the equipment. Catching finicky winter fish is frequently a challenging proposition. I have found that many things can help turn the odds in your favor. Fresh maggots, glow jigs, Vanish fluorocarbon line and quality rods can all help. However, there are still days when downsizing equipment is the most important thing that can be done. There is no doubt that fishing with super, ultra light equipment is not my first choice. However, there are those days when I tolerate the inconveniences associated with a light rig especially if it will help me catch fish. I started my outdoor career in 1987 when I began writing for Outdoors Weekly. I currently write about a 130 articles a year for various publications in the Midwest including the St. Cloud Times. In addition to writing and giving hunting and fishing seminars, I do weekly radio shows on two St. Cloud, Minnesota stations. These stations are WJON AM and WWJO FM. I also authored a book called Details for Locating and Catching Fish (available for $8 including shipping).